With this wonderful training DVD, you too can create spectacular looking cakes and cupcakes with guidance from the chef-instructors of The Culinary Institute of America. From buttercream roses and fondant-wrapped cakes to colorful cupcakes, the CIA Cake Art DVD provides the novice and intermediate cake decorator with the step-by-step instructions to produce show-stopping creations. Now That's Service That Sells! In this DVD by the Culinary Institute of America, the focus is on Cake decorating mediums, techniques and equipment. Cake Art offers clear and easy-to-follow directions for preparing several items featured in the CIA Cake Art cookbook, including the gift-wrapped cake, buttercream roses cake, and buttercream flowers cupcakes. 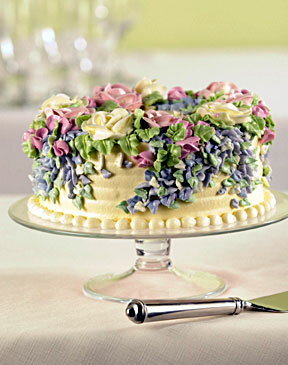 Preparing buttercream, with tips for delicious and attractive results. Creating single and multicolored buttercream designs using different piping tips. Covering a cake with decorative fondant using professional techniques for success. Making a selection of fondant decorations, including a bow, a plaque, and circles. Writing and painting fun and simple images using food coloring. Featuring the decorating insights of Chefs Kate Cavotti and Alison McLoughlin of the prestigious CIA baking and pastry arts faculty, the Cake Art DVD will give you the skills you need to create amazing cakes and cupcakes for all your special events.